My husband brought this clock home one day and I know nothing about it. 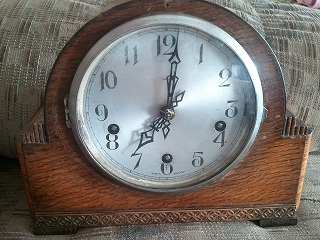 The face of the clock has an hour hand, a minute hand, three key holes located at the 8-6-4 numbers, a switch to make it chime or be silent, and it says Enfield, made in England. It's in a wood casing with a glass face cover and mechanical workings inside. 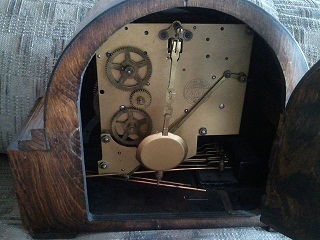 In the clock there are mechanical workings in a case with a pendulum attached and 5 hammers that hit the chime bars. 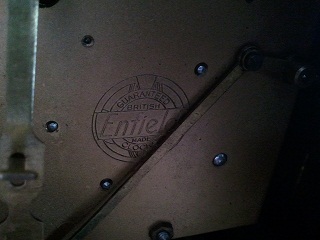 The case is engraved with Enfield, British made, guaranteed clocks, and PAT. no 421434. Any help in dating this clock would be appreciated.